The Rubbermaid Commercial WaveBrake Mop Bucket with Down Press Wringer Combo reduces splashing for a safer environment, cleaner floors, and improved productivity. The combo includes a 35-quart mop bucket with molded-in wave baffles to reduce splashing, graduated marks for measuring contents, and a down press mop wringer, tested to exceed 50,000 wringing cycles, that includes a tubular steel arm with a contoured handle for better grip. The bucket and wringer are made from structural web-molded plastic for better strength-to-weight ratio than standard injection-molded plastic. 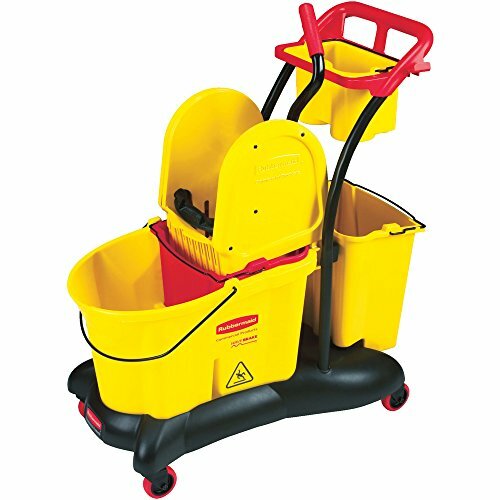 This mop bucket with wringer is suitable for commercial and industrial applications. The mop bucket rolls on four non-marking casters for mobility. Measures 29-7/8" x 18-1/2" x 27-3/4"